Join Us!!! We are looking for someone to help us cover Haitian basketball. Please send us an e-mail. JDA Dijon Bourgogne (ProA) added to their roster 27-year old American (has also Haitian passport) forward Kervin Bristol (206-101kg-88, college: Fordham). He played recently at Krasnie Krilya in Russian VTB league, but was released by the team earlier this month. In 19 VTB games he recorded 7.4ppg, 9.6rpg and 1.6bpg this season. The last season Bristol played at MBC Mykolaiv (Superleague) in Ukraine. In 15 games he averaged 12.7ppg, 12.4rpg (leader !!!) and 2.5bpg. A very spectacular season in his career as he was selected Eurobasket.com All-Ukrainian Superleague Import Player of the Year, Eurobasket.com All-Ukrainian Superleague Defensive Player of the Year and Forward of the Year. The previous (2013) summer he was tested by Huracanes (LNB) in Dominican Rep. league. Bristol ended the previous (12-13) season at Hopsi Polzela (Telemach League) in Slovenia. In 14 games he averaged 11.4ppg, 10.9rpg (leader !!! ), 1.1apg and 2.4bpg in 2012-13 season. But the most of that year he spent at Istanbulspor (TB3L) in Turkish league. In 19 games he averaged 10.1ppg, 12.2rpg (#3 in the league) and 1.6bpg in 2012-13 season. Bristol graduated from Fordham University in 2012 and it is his third season as a professional player. Defending champion U.D. 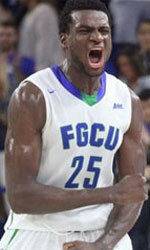 Oliveirense (LPB) agreed terms with 26-year old American (has also Haitian passport) forward Marc-Eddy Norelia (203-99kg-93, college: FGCU, agency: Duran International). He spent his 2-year professional career in France. He started the season at Caen Basket Calvados in French ProB. In 18 games he had 7.3ppg and 3.9rpg this season. The last season Norelia was tested by Caen (also in ProB). The list of the past achievements is quite long as among others his college team won A-Sun Tournament for two years in a row (2016 and 2017). Norelia was also voted NABC All-District 3 1st Team back in 2016. He graduated from Florida Gulf Coast University in 2017 and it is his second season as a professional player. NBL Canada newcomer Sudbury Five (NBL Canada) added to their roster naturalized Haitian forward Yohanny Dalembert (203-109kg, college: JMU). He played last season at London Lightning. In 34 NBL Canada games he recorded just 2.3ppg and 2.4rpg. Dalembert was voted CAA All-Defensive Team back in 2015 at his college time. Dalembert graduated from James Madison University in 2017 and it will be his second season as a professional player. BK 04 AC LB Spisska Nova Ves (SBL) tabbed 28-year old American (has also Haitian passport) center John Florveus (211-109kg-90, college: Georgia, agency: Slash Sports). He played most recently at ASA Koroivos Amaliadas in Greek A1 league. In four games he averaged just 2.8ppg and 2.3rpg last season. 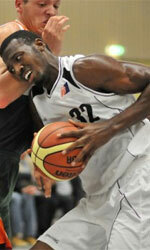 Florveus also played for Timba Timosoara (Liga Nationala) in league where in 10 games he had 13.7ppg, 7.7rpg and 1.3bpg. He is a very experienced player. And here thanks to pro basketball Florveus experienced life on four different continents. He is familiar with European, Asian, Latin American and of course North American leagues. Florveus has played previously professionally in Germany (s Oliver Baskets and Wuerzburg), Japan (Tokyo Cinq Reves), Georgia (Cactus Tbilisi) and Bolivia (Amistad). He attended University of Georgia until 2013 and it will be his sixth season in pro basketball.